Currawong fuel pumps are extremely configurable – different gear head combinations can be specified to meet fuel pressure and flow rate requirements. Currawong pumps have completed endurance testing to more than 1,000 hours of continuous operation and the pumps are rated for 700 hours between service intervals. The high reliability of the fuel pump reduces the airframe maintenance burden and provides added confidence in the fuel system. With very small power requirements (< 2W typically) these pumps are an excellent choice for extending the endurance of an aircraft. Additionally, running the pump in a tight pressure-regulation loop (as opposed to a dead-headed fuel rail) provides significant power savings as the pump spends a lot of time idle during the flight. Currawong’s Engine Control Unit (ECU) provides closed-loop fuel pressure control. The ECU provides a complete single-supply solution, with integrated high-power injector and ignition drivers, servo control of throttle position, closed-loop fuel pump control and a 6V supply for use with throttle servos and ignition units. All sensors and control systems connect directly to the ECU, which even includes high-power drivers for added GPIO (General Purpose Input Output) ports. 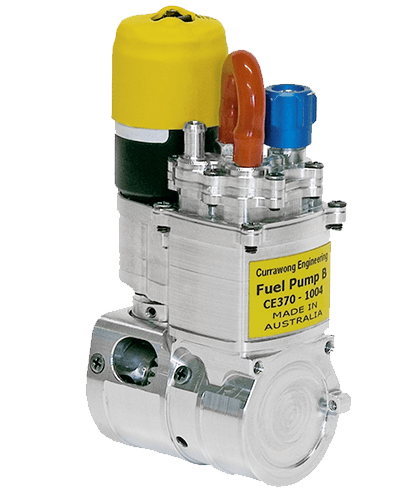 Currawong’s miniature fuel pumps are designed for fuel flow rates up to 120 grams per minute. These pumps integrate directly with the Currawong ECU to provide tight pressure regulation with minimal power consumption and added weight. A range of configuration options are available. Currawong’s fuel pumps, although developed to provide a reliable fuel flow for EFI systems, have a wider range of applications than just for EFI. Conventional fuel systems using carburettors are susceptible to fuel flow interruptions arising from operation in a three dimensional environment and require positive displacement, self priming pumps to assure reliable fuel supply. Currawong’s US distributor, Power4Flight, discusses the merits of fuel pumps that have the positive displacement characteristics of Currawong’s products in the technical paper below.